As it reaches that festive time of the year again it feels appropriate to revisit last year's editorial piece in the Edinburgh Evening News by our Clinical Director. By definition, no-one who attends the Emergency Department is having a good day, but this is felt more deeply on the festive days of the year. 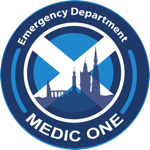 Whilst the crowds and anticipation build in town, at 6pm we will have just completed our shift-change handover, discussing all the patients in the Department, and sharing important news – “2 new cases of Meningitis in Midlothian: make sure it’s on your radar”, “Beds in orthopaedics are tight: discuss all referrals early with the co-ordinating nurses to get beds booked”. The rest of the Hospital is eerie quiet. Not many departments are staffed consistently 365 days a year, but not many departments have such unrestricted demand. The Doctors and nurses settle into the early evening rhythm of the department, “business as usual”, trying not to think about the parties they are missing, just focussing on their next patient, and pushing through, a couple of hours at a time. The minor injuries side of the Department is thankfully under control for now, so we concentrate our staffing on the “majors” side – patients who attend by ambulance and need to be assessed on a trolley. First up is Fred, all of 93 years, a war veteran and now a nursing home resident. He has dementia among other medical problems and is calling out to the nurse every five to ten seconds. He fell earlier today and his right leg seems to have lost a couple of inches somewhere and is pointing west. He’s broken his thigh bone at the top. We get him some strong pain relief, and organise his admission, but we know that he has a 50% chance that he’ll die within 12 months after an injury like this. We receive a few more fallers, some party season abdominal pains, our usual quota of patients with chest pain, and some collapses. Our average age of attendance in majors is around 70. This is brought down by a relative spate of patients on Hogmanay who can’t cope with the significance of another year passing, and, often with a drink or two inside them, decide to take an overdose or self-harm. The stress of the festive period, combined with the abundance of alcohol, reveals itself frequently to our staff, who deal with this cacophony of emotion with patience and professionalism. By 11pm, we have coped with the demand so far, and are in the eye of the storm. Edith arrives at 11.30. She’s 8 weeks pregnant, after 14 months of trying, her husband is at the street party, un-contactable, and she is miscarrying. She hears the pops and bangs of the fireworks and sobs quietly to herself. Fred’s occasional anguished and confused cry from the next door cubicle is the only distraction, whilst the nurse who’s looking after them both has to do the best she can for them, plus the nine others under her care. Around 12.30am, it starts. You tend to hear it at first, a hum and hubbub of activity at the reception desk, then see the queue build on our computer patient management screens. “The bus” has arrived. Wave after wave, ambulance after ambulance. Impossible numbers to process. We knew it was coming, but it doesn’t soften the blow. Everyone rolls their sleeves up and dives in, sorting the life-threatening scenarios from those less serious, then those less serious from those that can wait. This is a process called “triage” and requires skill and experience, and can be very frustrating to patients who are not top of the pile. Most would agree, though, that a patient having a stroke should be seen more quickly than someone with an ankle sprain. By 4am the place is still jumping, the badly injured or severely unwell have mostly been seen and treatments started. Now we have the backlog of patients with injuries that seemed less serious on arrival. Some of the anaesthetic effects of alcohol are starting to wear off and the jovial mood is souring slightly. Billy hobbles through with pain in both feet. He jumped off a bus shelter. He’s broken both heel bones and possibly more, and will need operations on his feet to prevent him feeling like he’s walking on marbles for the rest of his life. The Montagues and McCapulets are kicking off in the waiting room, something about a girl and the spillage of a pint. Hospital Security are busy somewhere else retrieving a wandering patient, so it’s left to a 5 foot 4 inch nurse to separate them, with assistance from some passing police officers. Another incident form required but lots of higher priorities right now. 7am and we’re in the home straight. The staff are out on their feet, but there is a sense of collective achievement in just finishing the shift. There are still patients waiting to be seen as we go to our morning shift-change handover, but they will be picked up soon by the new shift. New Year’s Day is our busiest day of the year, and the aftermath will continue right through till the rest of the world gets back to work on the 3rd - and beyond.